The Syracuse microgrid, one of 11 NY Prize Stage 2 winners, is forecasting a strong financial return using waste-to-energy generation that eases pressure on local landfills. Led by the Central NY Regional Planning and Development Board (CNYRPDB), the project is the only Stage 2 winner to rely on waste-to-energy conversion as its primary distributed generation asset. 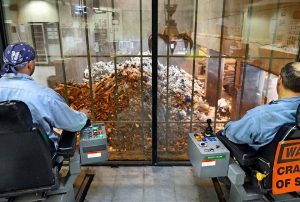 The community microgrid would reduce the amount of waste streaming into area landfills 90 percent if built as designed, according to feasibility study filed with the New York State Energy Research and Development Authority (NYSERDA), which is leading the $40 million NY Prize microgrid incentive program. That’s in addition to enhancing the efficiency, security, reliability and resilience of utility grid and distributed electricity services for more than 600 National Grid commercial customers and approximately 1,700 residential homes. The Syracuse microgrid project team pegs initial design and planning costs at approximately $840,000. In terms of financial returns, they calculate the present value of the project’s capital costs at an estimated $6.18 million. That would include the costs associated with installing a new 2-MW combined heat and power system and absorption chiller at the SUNY Upstate University Hospital-Community Campus (UUHCC), utility interconnection, upgrades to a distribution circuit at National Grid’s Rock Cut substation, and other system software and controls. 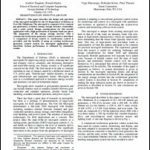 The present value of the variable costs of operating and maintaining the community microgrid are estimated at approximately $3.35 million, or $17/MWh. In addition, the project’s internal rate of return (IRR) comes in at 222 percent and its projected benefit-to cost-ratio at 2.6,,which essentially means the community microgrid is expected to return $2.6 for every $1 in costs. “To say the Syracuse Community Microgrid Project is technically and financially feasible may be a significant understatement,” said Chris Carrick, who leads the project team for CNYRPDB. National Grid, the utility that serves that area, is playing a key role on the project team, coordinating and providing electricity and gas system information, as well as guidance regarding regulatory, right-of-way, interconnection, engineering, rates, programs and other critical utility information to ensure electric system safety and reliability, according Virginia Limmiatis, National Grid spokesperson. “While other microgrid projects may require the installation of new generation to achieve self-sufficiency, the Syracuse microgrid proposal uses an existing, large scale generator. This leverages an existing asset for microgrid utilization,” she said. More broadly, project partners highlight the Syracuse Microgrid’s capacity to improve human and environmental health and quality by reducing greenhouse gas (GHG) emissions and other negative environmental impacts associated with conventional power generation, transmission and distribution. Those attributes fall right in line with the goals of the NY Prize and the state’s Reforming the Energy Vision (NY-REV), a revamping of energy rules to foster a decentralized grid. “The goal of Governor Cuomo’s NY Prize initiative is to help communities become more resilient during power outages caused by extreme weather events and emergencies,” Saintcross added. “During an extended outage, the waste-to-energy facility is expected to have sufficient energy for these customers during a power outage lasting for up to seven days. Serving as the project’s ‘anchor’ generation asset, Onondaga County Resource Recovery Authority’s (OCRRA) WTE facility only enhances these benefits, according to Carrick. “The potential financial and business operation model provides a significantly enhanced revenue stream for OCRRA, which in turn provides a sustainable model of operation where additional landfills are not necessary and we have a cleaner, healthier community,” he said. 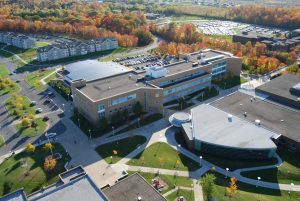 SUNY Upstate Hospital, for instance, experienced five power outages for the two utility feeds that serve the campus in 2012, six in 2013 and 10 in 2014, Carrick noted. Both feeder lines have failed twice in 50 years. Relying on emergency back-up generation, the hospital had to cut services some 50 percent. Looking ahead, advancing to stage three of the NY Prize competition would be a good sign that the Syracuse microgrid will actually be built, National Grid’s Limmiatis pointed out. Twenty million in NY Prize funds are up for grabs in Stage 3 of the competition. “In addition, NY Green Bank is prepared to facilitate up to $50 million in financing assistance per project design,” NYSERDA’s Saintcross said. 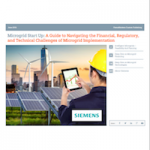 Furthermore, “projects will need to demonstrate they can attract the scale of financing necessary to build and operate microgrids. Projects that can achieve this milestone will pave the way for the scaling of microgrid development, which is the ultimate goal of NY Prize,” Saintcross said. The Syracuse Microgrid would make a substantial contribution to achieving NY-REV grid modernization goals, Carrick said. “The microgrid will incorporate monitoring and control technology to allow other DERs to supply the load in the network without putting the grid operation at risk. This will create opportunities for customers on the microgrid to interact with the main grid, participate in the market, and define new streams of revenue and value,” he said. Pursuant to these ends, the community microgrid project team has discussed options regarding interaction of the microgrid with regional transmission authority NY-ISO as well as National Grid. Carrick explained that the interaction with the surrounding grid across a Distribution System Platform (DSP) through market animation is a major aspect of REV. “For instance, one possible innovation that may be considered within the REV framework is optimal economic operation of the resilient microgrid during blue sky days (i.e., during normal, non-emergency periods), by participation in the utility demand response programs and also NYISO’s energy, ancillary services, and capacity markets,” he said. Objective: Enhance quality, reliability and resiliency of grid and distributed electricity services; lower energy costs, greenhouse gas emissions and environmental impacts; demonstrate the value of distribution automation, smart grid technologies and dynamic load management approaches to provide grid resiliency throughout New York State. Scope: Three critical anchor facilities: SUNY Upstate University Hospital-Community Campus (“UUHCC”), Onondaga Community College (“OCC”), and Loretto Health and Rehabilitation Center (“Loretto”), as well as other public and private facilities, including a nursing home, a senior housing complex, a fire station, the Onondaga County consolidated 911 dispatch center, an elementary and middle school, public housing and apartment buildings, and approximately 2,000 residential and small commercial customers. Energy Services: 24×7 baseload power generation and distribution sufficient to meet demand for more than 600 National Grid commercial customers and approximately 1,700 residential homes. Estimated seven-day emergency power microgrid generation and distribution upon conversion to island mode. Installation of a 2×1-MW combined cooling, heat and power plant paired with a 400-ton indirect fired absorption chiller located at UUHCC. 115-kV feeder line from UUHCC WTE to National Grid Rock Cut substation for grid-connected and microgrid island distribution. Track news about the Syracuse microgrid and other NY Prize winners by subscribing to the Microgrid Knowledge newsletter. It’s free. REV is in the Air. And the Microgrid Industry is Feeling the Love, Mostly.